Word to the Wise: Contracts automatically obligate the PTA through its insurance Policy - if a lawsuit is filed, it is the PTA policy that will be used to pay attorney fees, court costs, and settlement damages). Use of existing communications between the PTA and school board. Use of existing "charitable" tax deduction status for donations (See this document for more information). Immediate credibility and validity in the community. Eliminate preparation of IRS tax forms. PTO NOTE: Parent Teacher Organizations (PTO) typically do not have the same capabilities as a PTA. For example, PTO organizations typically are not 501(c)(3) "charitable" tax-deductible organizations. Word to the Wise: Grad Night should also keep a copy of the vendor verification form. Word to the Wise: If the PTA has purchased a bond, the Grad Night treasurer (and anyone else authorized to sign checks) should also be named in the bond. This may require a Grad Night representative serving on the PTA executive committee. Word to the Wise: Non-profit organizations cannot solicit for one purpose (such as Grad Night) and then use the funds for another purpose. Unless otherwise stated in fundraising letters and publicity, all funds and items received for Grad Night must be used for that purpose. Funds cannot be reassigned to other uses such as funding a future class reunion or placed in the general PTA fund unless donors were made aware of this when the donation was solicited. Beginning and ending Grad Night checking account balance. Amount of each check plus receipts for purchased items. A list of all donations (including prizes). A complete record of fundraising efforts (including gross income, expenses incurred as well as profit made). Ticket sales (including free tickets). Copies of all contracts and vendor liability insurance verification forms. Provide periodic reports to the PTA Board. Assign a Grad Night representative to be a member of PTA Board. Obtain PTA approval before signing contracts. Provide copies of vendor liability insurance verification forms to the PTA. Use the PTA Employee Identification Number (EIN) on the Grad Night checking account. Typically, the PTA will agree to a separate checking account for Grad Night. Obtain PTA approval prior to fund raising activities. The PTA must ensure the fund-raiser does not conflict with PTA rules or a fund raising effort for a school function. Obtain agreement with the PTA board about what will happen with unused/excess Grad Night items or cash. Provide complete and accurate financial records to the PTA. Can a PTA work with another group in a cooperative project such as a Grad Night party? Yes, a PTA may work with another group; however, projects are required to be submitted for approval to the voting body of the local PTA unit. If funds are required for the project, the local PTA may bear its share of the expenses. When a PTA participates in a joint endeavor, the PTA must make sure the rules of the PTA do not conflict with the by-laws of the organization with which they are cooperating. If there is a conflict, the PTA should withdraw from participation in the event. Does a Grad Night party have to be approved by the general membership of a PTA? What responsibility does a Grad Night chairperson have to the PTA? The chairperson of the party should be a member of the Local Unit PTA Board. The chairperson should present a work plan to the PTA Board for approval. The chairperson should present a financial plan to be included in the local PTA budget and approved by the general PTA membership. The Grad Night chairperson should give a report at each PTA Board meeting on finances and an update of activities. Can the Grad Night Chairperson enter into contracts without the knowledge of the local unit PTA president? No. The PTA president is responsible for contracts. The PTA president should be the only officer negotiating the contract. One of the final approval signatures could be that of the Grad Night chairperson. Does PTA bonding insurance cover Grad Night chairperson or the committee? Yes. PTA bonding insurance covers all volunteers who handle money. Word to the Wise: Although the money is the apparent property of the PTA, donation laws prohibit the use of this money for any purpose other than that which it was designated. If the money was designated for Grad Night, the PTA cannot spend this money for anything except Grad Night. This item needs to be carefully resolved with the PTA. Does money raised by the Grad Night committee belong to the PTA or to Grad Night? According to the PTA, all money raised from local dues and through additional efforts and other assets, including checking accounts, savings accounts, and certificates of deposit, are the property of the local PTA unit. There may seem to be a lot of restrictions, but keep in mind all of the financial record keeping must be done whether or not a PTA sponsors your Grad Night. 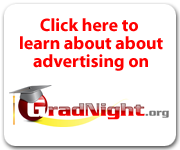 Your Grad Night always has the option of finding other sponsorships. Be sure to check with the school principal before exercising this option, however, as you may find that he/she will insist upon Grad Night coming under an already organized and recognized group such as the PTA.